Welcome to the easiest, most delicious breakfast you’ll ever have. What’s that? You didn’t know you could have dessert for breakfast? Well I’m here to tell you that you CAN! And you SHOULD! 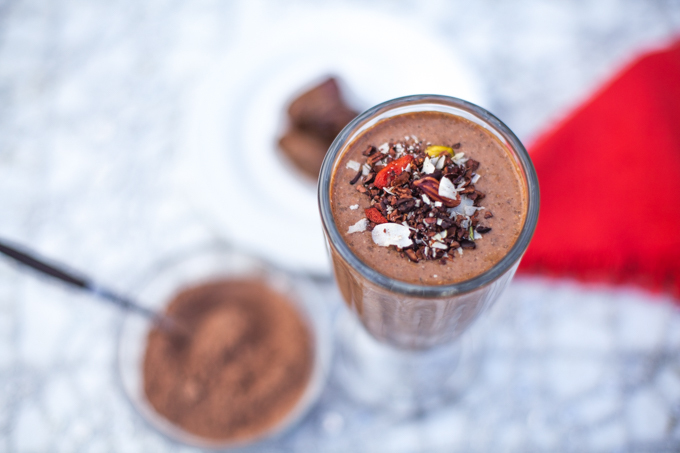 This raw vegan chocolate shake will leave you feeling full and energized for hours. This raw vegan shake is packed with nutrition and deliciousness! Made with dates, chia seeds, and raw cacao, it’s full of antioxidants, fiber, and protein! Since making initially making this recipe, I’ve started pairing it with a SUPER easy raw vegan hot fudge sauce. It’s not pictured, but rest assured. It’s really tasty! A healthier version of a classic chocolate shake! Made with raw cacao, chia seeds, and soft dates. Blend all ingredients and enjoy!! Make sure to blend the smoothie for at least two minutes so the chia seeds can thicken it up. To make your own raw cashew milk without too much trouble, combine 1 cup filtered water with 1 tbs soaked cashews and blend for 1-2 minutes. No need to strain, just add the other ingredients and keep blending. To make the raw vegan hot fudge, blend all ingredients on high until smooth. Add water to thin it out. Add more dates if it's too thick. If you want to save this raw vegan chocolate shake for later, simply pin the photo below!